UPDATED: May 5, 2014, at 1:40 p.m. Occupancy at the Science Center Plaza swelled above its usual levels last Friday afternoon when curiously large crowds milled about the tables, benches, and food trucks, poised to take part in a synchronized flash mob to raise awareness of the need to eradicate malaria. At 4:10 p.m., the sound of a single voice pierced the air through a megaphone—“Ready, set, go!” At this signal, 200 students sprang to their feet and popped in their earphones. Over the next half hour, they fist-pumped, swordfought, and formed a massive human “M,” drawing the attention of passersby. 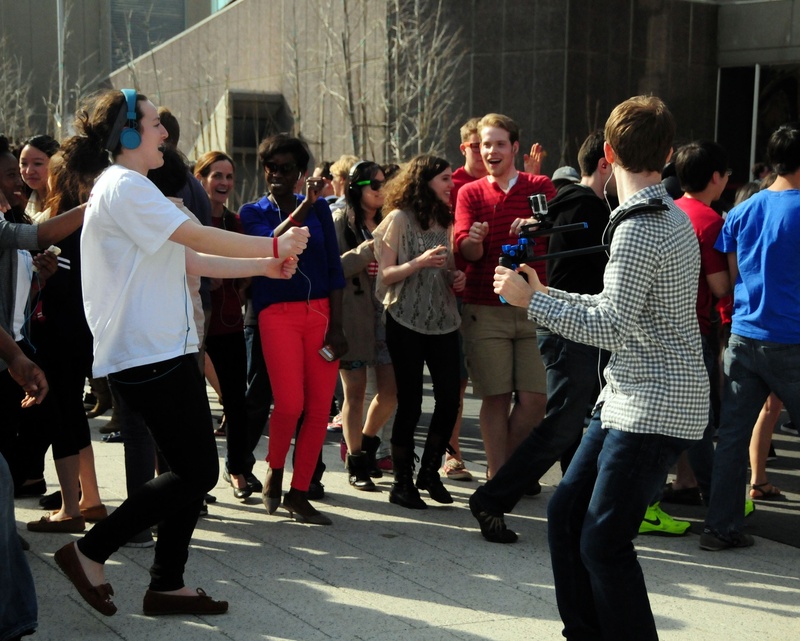 The flash mob was part of an international campaign to publicize Global Malaria Day. Dyann F. Wirth, director of the Harvard Malaria Initiative and the chair of the Department of Immunology and Infectious Diseases at the Harvard School of Public Health, and the chief of staff for Ray Chambers, the United Nations Special Envoy for Malaria, were present. A total of nearly 350 students participated in similar mobs in Beijing and Harare, Zimbabwe. A winning proposal of the Harvard Malaria Competition, Mob Malaria was funded by Chambers, Harvard’s Defeating Malaria initiative, and an organization called Malaria No More. Mob Malaria co-founders Stephen A. Turban ’17 and Lily H. Zhang ’17 said they wanted to diverge from the sentimental approach of traditional global health campaigns for their malaria awareness project. After meeting several times and considering ideas that ranged from Model United Nations-style conferences to zombie video games, Turban and Zhang decided upon what they called a more “shareable” project—a flash mob. Various Harvard comedy groups helped Turban and Zhang bring their vision into fruition. Satire V publicized the campaign via social media, while On Harvard Time filmed the event and wrote the script for the audio file that guided the mob. As they finalized their project, Turban and Zhang said they also decided to scale their efforts up to the international stage. Initially, they said they tried to leverage Harvard’s institutional connections abroad. “Then we realized that the whole point was to involve students. So we ended up connecting with them directly,” Zhang said. Ultimately, in Zimbabwe, two directors and 30 volunteers enlisted local doctors to speak about malaria, tailoring the event to malaria prevention and other concerns of the local population, Zhang said. As Martin Luther King Jr. understood, it takes collaboration across the lines that continue to divide us to effectively address the major problems facing the world. Tomorrow the Harvard men’s club soccer team will be hosting the “Kick Out Malaria” Tournament for the second year in a row. Studies in Kenya and Gambia have shown that preventing malaria and anemia in schoolchildren may be a more effective way to improve education levels than direct intervention in schooling, said Graduate School of Education Assistant Professor Matthew Jukes in a speech yesterday. Somehow, I survived, and today here I am, writing this piece.